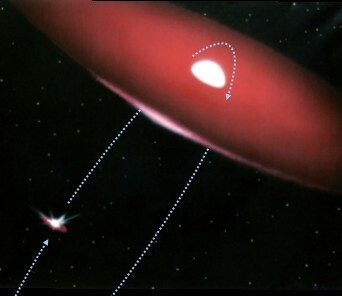 Illustration of a binary system similar to the PSR B1259-63/SS 2883 system, where the pulsar orbits a massive Be star with a disk-like outflow of stellar material (from Hubble archive). The actual viewing direction from Earth is from the lower left, so that the pulsar is behind the disk at the time of closest approach to the star (periastron). PSR B1259-63/SS 2883 is a fairly unique system with a pulsar (PSR B1259-63) in a highly excentric orbit around a massive Be star, SS 2883 (Johnston et al. 1992). The star is characterized by a non-isotropic stellar wind, a disk-like outflow of stellar material (see Fig. above). Every 3.4 years, at periastron, the pulsar comes within 1013 cm from the Be star and, on its way, crosses the outflow twice. During this time, the pulsar radio signal is eclipsed. 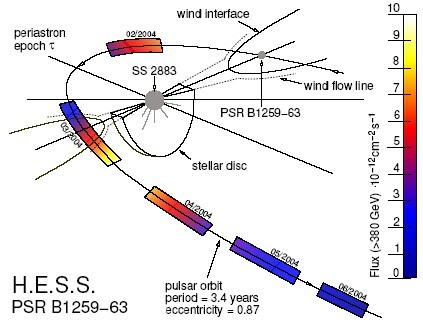 Assuming that the pulsar accelerates electrons in the strong electric field generated its the rotating magnetic moment, PSR B1259-63/SS 2883 was predicted as a variable source of TeV gamma rays (Kirk et al. 1999). The flow of highly relativistic electrons - the pulsar wind - ends in a termination shock, where the pressure of the wind is balanced by the ambient medium; in this shock, additional particles can be accelerated. In particular during crossings of the stellar disk, the outflow from the Be star strongly confines the pulsar wind, resulting in a contact discontinuity with the shocked pulsar wind on one side and the shocked outflow on other. Unlike in isolated pulsars, with a spherical or circular wind termination shock, the directed radiation pressure and ambient flow should result in a bow-shock or "cometary" shock geometry. The gamma rays are generated when the high-energy electrons Inverse-Compton scatter photons of the Be star (Kirk et al. 1999 ,Ball & Kirk 2000); the flux of such target photons varies with the inverse square of the distance between the Be star and the pulsar. As another possibility for gamma-ray production, interactions between shock-accelerated protons and the outflow have been discussed (Kawachi et. al 2004). In the enhanced ambient magnetic fields, the electrons also create synchrotron radiation, which is visible e.g. in X-rays. Throughout the orbit, but in particular near periastron, different energy loss mechanisms - synchrotron radiation, Inverse Compton scattering and adiabatic losses caused by the expansion of pulsar wind against the external pressure - compete with each other (Tavani et al. 1996) and provide a fascinating laboratory to study pulsar winds and pulsar wind interactions. H.E.S.S, observed PSR B1259-63 about two weeks before periastron in March 2004, and followed the object until June 2004, with observations interrupted by full moon periods, where the telescopes cannot be operated. A clear TeV signal was quickly detected from the direction of PSR B1259-63 (Fig. 1), with a second - yet unidentified - TeV source visible in the field of view. The signal from PSR 1259-63 was found to vary significantly (Fig. 2), making it the first variable galactic TeV source. The relatively high pre-periastron flux decreased towards periastron; the periastron passage itself coincided with full moon and could not be observed. After periastron, the initially very small flux increased and then faded out over the next months. Fig. 3 illustrates how the TeV flux varied along the orbit. The flux reached its maxima near the times of the crossing of the disk of the Be star. The uncertainty in the disk orientation and disk width do not allow to decide if the maxima coincide exactly with the disk crossings, or if they are displaced, as seems the case for the nominal disk geometry assumed in Fig. 3. Radio (Johnston et al. 2005) and X-ray flux (Shaw et al. 2004) observed during the 2004 periastron passage show a similar time dependence, with a less pronounced minimum around periastron. The fact that both synchrotron and Inverse-Compton (TeV) fluxes are low during periastron excludes models where radiative energy losses of accelerated electrons dominate, and show that there must be other mechanism, through which electrons lose their energy faster then by radiation - presumably adiabatic losses. The double-peaked TeV light curve, on the other hand, is qualitatively - although not quantitiatively - described by a model where accelerated protons interact with the outflow Fig. 3. To gain further insights, PSR B1259-63 will certainly be a target of future H.E.S.S. observations. Fig. 1: Sky map of TeV gamma-ray signals, centered on the position of the pulsar, for February 2004. The excess north of the pulsar is the unidentified TeV source HESS J1303-631. Fig. 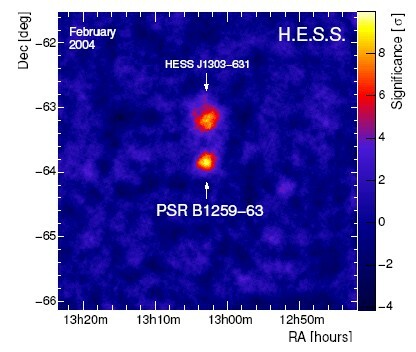 2: TeV gamma-ray flux from the pulsar PSR B1259-63, measured between February and June 2004. The short-dashed vertical line indicates the closest approach to the Be star, the longer-dashed lines the duration of the radio eclipse, during which the pulsar is presumably behind the disk. Curves show model predictions; the Kirk et al. (1999) models are based on Inverse-Compton scattering of high-energy electrons in the radiation field of the Be star, whereas the Kawachi et. al (2004) model assumes hadronic interactions in the disk. Illustration of the variation of the TeV gamma-ray flux (color-coded) along the orbit of the pulsar. Location and width of the stellar disk are only approximately known. The figure below illustrates the formation of a "cometary" pulsar wind termination shock in a flowing ambient medium - such as the Be star outflow - with a contact discontinuity and shocked medium on the other side (van der Swaluw et al. 2003).